You might have noticed that things were rather quiet here last week. We went on our last family vacation of the summer before the kids go back to school in a few weeks and I decided it was a great time to unplug. Of course, we were camping on a beach with no electricity (much less an internet connection) so I didn’t have much choice. However, the point is that sometimes it’s good to really get away and just enjoy the simple things in life like sitting in a beach chair reading a good book while the ocean breeze blows through your hair. There is no distraction (or temptation) of checking e-mails or over analyzing blog stats. Eventually, you do have to return to real life and deal with things like what to make for dinner. 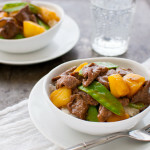 When that moment hits, it is good to have a recipe like this beef stir-fry with pineapples and snow peas in your repertoire. In our house, stir-frys are a regular part of our dinner rotation but the kids especially like this combination because the pineapples add a natural sweetness to the dish. The kids would be perfectly happy to have just the beef and pineapples but stir-frys are one of the easiest ways for me to get them to eat vegetables so I’m not about to give up that opportunity. The snow peas not only add some extra nutrition but also some nice color and a little bit of crunch. You can replace the snow peas with thinly sliced carrots if you can’t find snow peas. That’s it for today. After being gone for a week, I’m still playing catch up with my long to-do list … missing the beach already. Mix together cinnamon, granulated garlic, celery salt and ground pepper in a small bowl. Sprinkle spice mixture over beef and stir until all the pieces are evenly coated with spices. Add sesame oil and mix until beef is evenly coated with oil. Set aside. Heat canola oil in a medium sized wok over medium-high heat until oil begins to shimmer. Add garlic and stir until garlic is fragrant and starts to brown. Remove garlic clove from pan and discard. Rotate and tilt pan so that oil evenly coats the bottom and sides of the wok. Add beef in an even layer around the wok. Let the beef sit a minute or so until it starts to brown. Then stir the beef and let cook until lightly browned all over and beef is just cooked through. Add in oyster sauce and stir until the beef is evenly coated. Transfer beef to a clean bowl or plate. Return wok to stove. Add pineapple chunks and cook 1-2 minutes over medium-high heat, stirring occasionally, until pineapples start to soften slightly and release their juices. Add snow peas. Cook pineapples and snow peas, stirring occasionally, until lightly browned, about 2-4 minutes. Add vegetable broth and bring mixture to a simmer. Cover pan and let snow peas cook until tender-crisp, about 2-3 minutes. Uncover pan, add beef and any accumulated juices back to pan. Stir to combine. Stir cornstarch mixture to re-combine and add to pan. Bring mixture to a simmer. Cook until sauce thickens slightly. Remove from heat and serve immediately with rice. You can use any cut of beef you prefer – flank steak, strip steak, rump roast. Be sure to slice the beef against the grain. Oyster sauce can be found in the Asian aisle of most grocery stores and at Asian grocery stores. Oohhh I love beef stir fries!!! My mom makes it all the time, but not with pineapples and snow peas. I think that would be such a wonderful combination!!!! I love stir-fries too – the possibilities are endless. I hope you get to try this one soon. It’s delicious! I totally agree. Stir-frys can be real life savers. Thanks for dropping by, Ana.